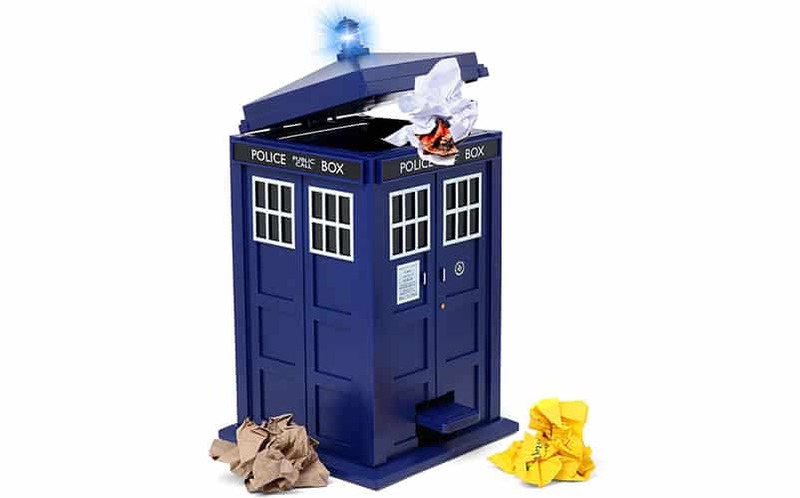 Doctor Who TARDIS Wastebin | Nerd Much? There’s a TARDIS edition of everything nowadays, it seems. TARDIS backpacks, TARDIS USB hubs and even a TARDIS jewelry box all exist. There are also plenty of cool desk toys based on Doctor Who. So it would only make sense that there is a Doctor Who TARDIS Wastebin, too. The Doctor Who TARDIS Wastebin plays a materializing sound when it’s opened, and a dematerializing sound when it’s closed. It also illuminates. There’s a removable interior can with a handle for easy trash removal and washing. It runs on 3 AAA batteries (included), and the switch under the lid allows you to turn off the sound effects if you’d like. But, you probably wouldn’t like. In fact, you’ll never turn it off, so we’re not quite sure why that even exists. Unfortunately, it doesn’t really dematerialize, and only plays the sound effect. That’s probably a good thing actually, as it means you won’t have to keep buying a new TARDIS wastebin every time it’s used. For more ridiculously cool stuff you probably don’t need to buy, stay tuned to Nerd Much.